Minimum purchase time is 15 days. For bigger purchases we offer discounts from 5% to 30% off. The prices are different for each category. All ads are activated instantly after payment is approved. We accept Paypal and all major credit cards. For Skrill, Bank Transfer or other payment methods contact us. A big ad 955x90 pixels image located above our category submenu. 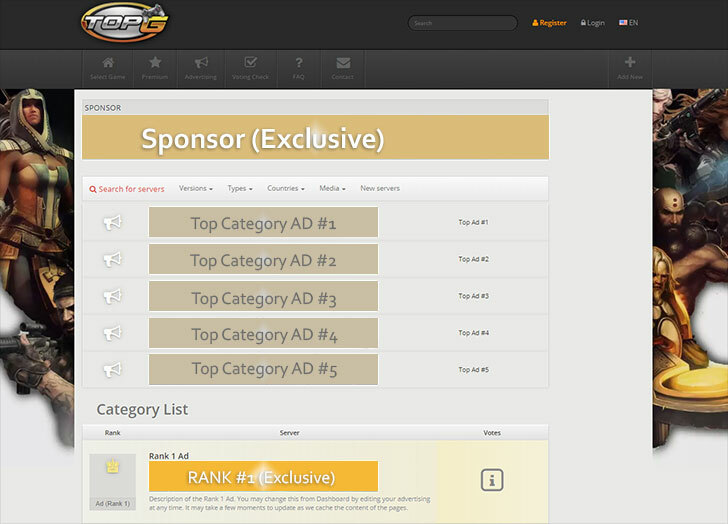 Check availablility on our create ad page. Positioned above all sites and servers this spot gives good results with a nice click rate. We display 5 ads per rotation. If there are 6 or more advertisers we rotate all ads (5 by 5 in random order) for each visitor so all banners get on top #1 one by one. Special exclusive spot simulating rank 1 listing on top. Check price and availability for targeted category on Dashboard > Create Ad.